Perhaps you’re a little paranoid if you treat your dorm room like some sort of lockdown safe house. Then again ... perhaps not. Dorm-room theft is all too common at any school. Your dorm room supplies are your prized possessions, so you should take care of them! Still, there’s no need to bring some big, bulky bank-style safe to your dorm. Dorm safes are practical and smart additions to your supplies checklist for college. But you can still be practical and even stylish without looking like you’re hiding gold bars in your dorm room. And when you’re on the go, you’ve probably heard horror stories about stolen laptops and other college valuables. Whether in the dorm or on the go, keep your stuff for college protected from thieves. 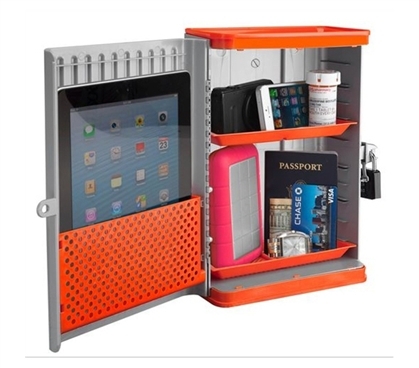 Even your most insidious and tactful dorm thieves will have an impossible time trying to steal anything within our Tablet Safe. This dorm safe isn’t really your traditional dorm safe; it has a mounting back bracket to attach it to unmoveable furniture such as your bed or desk. The mounting brackets are safe to attach to boards and round furniture poles. Inside the Safe there is room for your tablet, wallet, passport, and any other valuables you may have that you don't want leaving your room. And when you’re heading out for extended periods of time, you can relax knowing you kept your dorm room thief-proof. While many dorm thieves can steal valuable college items right under students’ noses, a skilled thief can break into your dorm room. With our Smart Sensor Alarm, this little device detects changes in air pressure and responds with a triggered alarm if a door or window is opened. This dorm alarm is especially useful if you live on the ground floor and a thief could sneak in through a window. Since this handy dorm room alarm isn’t motion activated, you can walk about freely and not trigger it. Just be sure to switch it off before you open the door, and let your roommate know when it’s activated! Laptops are amid the most stolen and certainly are the most sought-after college items for dorm thieves to pursue. A stolen laptop can be a real semester killer—you’d be so angry that someone stole your laptop and angry at yourself for letting it get stolen! It’s never wise to keep your laptop unguarded, even if you’re just taking a quick trip to the bathroom or vending machine. To avoid taking any chances, use this Iron Brick Safe. 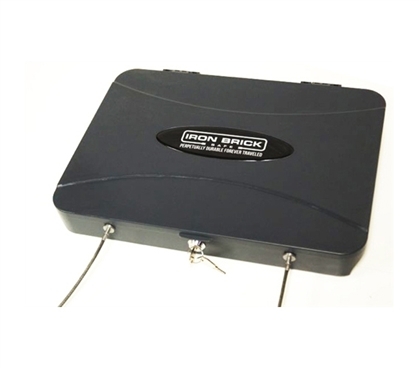 The Iron Brick Safe holds all laptops that are 15" or less (Apple can be held if 13" or less) and has cushion foam on the top and bottom inside for laptop protection. Also, the cable attached to the Iron Brick Safe secures the safe to beds, desks, beams and other unmoveable furniture. When you are on the go, you can still keep safeguarding your college stuff your primary concern. 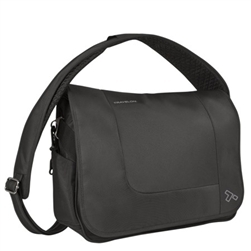 Our Slash-Proof Laptop Messenger Bag has a lock and, as its name implies, is slash proof. Any dorm thief who’s looking to run off with your college bag will find it downright impossible to infiltrate this bag for college. Even if he tries cutting through it, this bag will keep its contents safe. Your laptop will obviously be your main item to guard, as this bag is large enough to fit most college laptops. You can also keep your tablet, cell phone, wallet or any other valuable college items safely inside.